Astronomical objects emit many forms of energy, which neither the human eye nor ordinary telescopes can detect. Infrared is one form of this invisible energy. SOFIA is an airborne observatory that will study the universe in the infrared spectrum. Besides this contribution to science progress, SOFIA will be a major factor in the development of observational techniques, of new instrumentations and in the education of young scientists and teachers in the discipline of infrared astronomy. NASA and the DLR, German Aerospace Center, are working together to create SOFIA' a Boeing 747SP aircraft modified by L-3 Communications Integrated Systems to accommodate a 2.5 meter reflecting telescope. SOFIA will be the largest airborne observatory in the world, and will make observations that are impossible for even the largest and highest of ground-based telescopes. The observatory is being developed and operated for NASA by a team of industry experts led by the Universities Space Research Association. 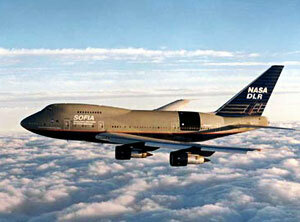 SOFIA will be based at NASA's Ames Research Center at Moffett Federal Airfield near Mountain View, California. SOFIA is just one of the space-based observatory missions under NASA's Origins Program, which along with the ground-based observatories paves the way for future achievements. As each Origins mission makes radical advances in technology, innovations will be fed forward, from one generation of missions to the next.